Remember when Ali knocked out the Beatles? Home/Art, Creative, Events/Remember when Ali knocked out the Beatles? 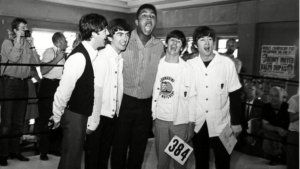 My Throwback Thursday tribute is to the Beatles meeting with Muhammed Ali. Imagine being an upstart feature writer who’s been inexplicably assigned to cover a boxing match in which the odds are 7:1 that the heavyweight world champion is going to knock out the brash, loud-mouthed challenger he is facing. It’s a couple of days before the fight and you’re at the challenger’s gym waiting for the start of yet another boring training session when in comes four skinny mop-haired guys cursing and carrying on because Cassius Clay is running late. 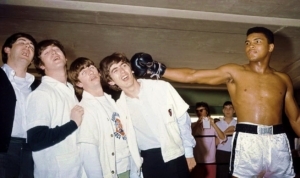 Scottish-born photojournalist Harry Benson was shadowing the band on their inaugural trip to the United States and the legendary pictures he took of Ali (he changed his name two months after wresting the heavyweight title from Sonny Liston) clowning with the Beatles are collector’s items today. 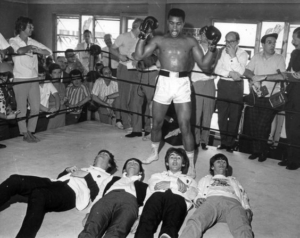 In them, Ali is shown knocking the Beatles down like Dominos and standing over them sprawled out in the ring. Little did anyone know at the time that the latter pose was a precursor to the famous photo of Ali standing over Sonny Liston in the first round of their rematch, mocking him and challenging him to get back up and resume the fight. The Beatles may have been performers, but it was Ali that day who demonstrated that he was an entertainer extraordinaire. The Beatles and Muhammed Ali are arguably the best rock ‘n’ roll band and heavyweight boxer in history, but at the time of their meeting, they represented unrealized potential. True, the Beatles had enjoyed tremendous success in Europe and England by then, and had knocked out the U.S. on their first Ed Sullivan appearance. 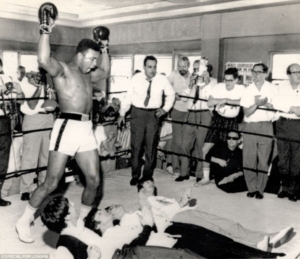 Ali was a gold-medal Olympian and 19-0 at the time he fought Sonny Liston in Miami Beach for the title. But we know today that they were just beginning their meteoric rise to the pinnacle of their professions when they met in 1964. And it was that unrealized potential that inspired me to include their meeting in my Beatles Collection. 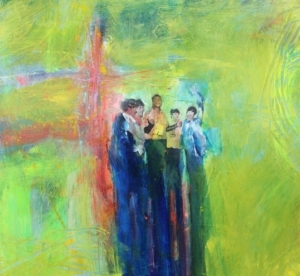 There are lots of originals and prints of the paintings in my Beatles collection at the gallery in and my warehouse. Just give us a call. The number is 239-938-5655.